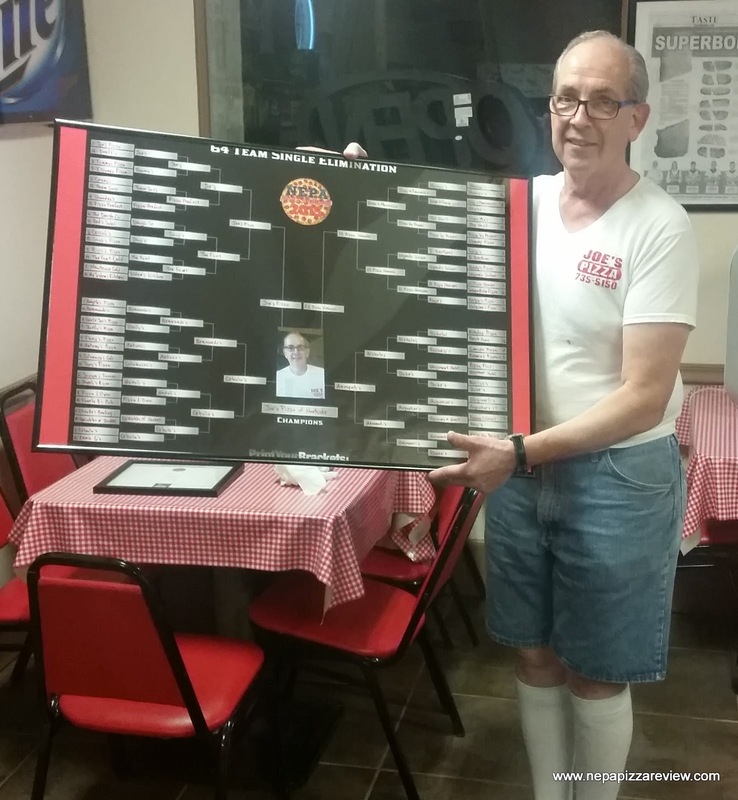 By now, you may have heard that Joe's Pizza of Nanticoke is the 2015 NEPA Pizza Madness Champion. His "little pizza shop that could" which features a "one man show" who makes the pizza, greets the customers, waits on tables, works the cash register, answers the phone and much more took on all the competition that NEPA had to offer and won! Stop back soon to read more about the contest and finalists! I first met Joe in 2013, when I was seeking donations for NEPA Blog Con, and he contacted me to donate 100 free slices of pizza to the cause which benefited a local animal shelter. I was humbled by his generous gesture and drove nearly an hour to meet the man who would be supporting this local charity. Joe was working at his seasonal location at Dundee Gardens in Nanticoke and when I arrived I opened my car door and followed my nose to the source of the wonderful pizza smell to find a line of people waiting to see the man working the oven and serving the customers himself. I waited in line a few minutes which gave me an opportunity to observe an analyze the pizzeria setup which I always do on pizza reviews. For the first time ever, I found myself not at all concerned with the pizza counter or the ingredient setup, but fascinated by the way that customers were drawn to the man behind the counter. I watched each customer greet Joe by name (and his name was not on the sign) and observed Joe give each customer personalized attention and strike up a conversation with each one. This wasn't your traditional, "How you doing, now move along" customer service that you typically get - this was genuine care and communication with community members who cared equally about the man who was serving up more than just a slice of pizza to them. Of course, giving customers all of this additional attention takes a little extra time, but no one seemed to mind, and I certainly did not because I was amazed to see this type of service and community spirit that is lacking in many other places. My mind started to wander and I thought, are the people here for Joe or Joe's pizza? I decided I would give the pizza a try even though I had already eaten lunch. When it was finally my turn to step up, I introduced myself to Joe and he greeted me with a smile and treated me as if I was a longtime friend and gave me an immediate sense of comfort and I could immediately see why so many people flock to Joe. Joe spent quite some time talking to me, explaining the history of his pizza and everything that goes into it. He is very confident in his product and for good reason. I ordered a slice while we were talking and I was immediately impressed by his unique pizza creation. And so it was settled, people go to Joe's for an incredible customer experience provided by Joe and to get a great slice of pizza (or stromboli)! Since that time, I have visited Joe's Pizza 3 more times, and each time Joe has taken significant time out of his busy schedule to to chat with me and treat me like family, as he did with each customer that passed through his door. One thing I noticed is that Joe has a deep understanding and close relationship with his customers that allows him to connect on deep levels with all of them. Joe understands that economic times are tough out there, so he created a worker's penny pincher special which provided a whole pizza for a ridiculously low price. This is just one example of how Joe connects with his customer base. His community involvement and charity is also well documented with all of the various organizations that he supports locally. I encourage you to visit the website to find out more about Joe's amazing life story and Joe's Pizza history! So I can understand why Joe is what I will call somewhat of "the Mayor of Nanticoke" because everybody in town seems to know and love him, but what I couldn't understand was how does he have so much support from the Luzerne County and NEPA region to claim victory in the NEPA Pizza Madness Tournament? I asked him this very question, and he said he was totally shocked that many people would vote for his pizza. Joe seemed a bit overwhelmed that he would be able to rack up nearly 50,000 votes from his supporters. To understand how those votes tallied up so quickly, you have to go visit Joe's Pizza Facebook Page. Joe credit's most of his success in the tournament to his selfless and tireless family member who goes simply by the moniker "Mr. Webmaster." Mr. Webmaster was responsible for the relentless and creative posts not only during the NEPA Pizza Madness Tournament, but throughout the year. No one will forget the production value of Joe's training videos, or the sheer genius of "Pizza Crush" the game that encouraged people to get out and vote. Joe is eternally grateful to Mr. Webmaster for everything that he does for him out of the goodness of his own heart. Joe spoke so highly of Mr. Webmaster that I reached out to him to pick his brain a little bit. While chatting with Mr. Webmaster, I immediately noted that the mutual admiration and appreciation that Joe and Mr. W have for each other. When I asked why Mr. Webmaster dedicates so much of his time to Joe's online presence, he simply said "I owe him." Joe has done so much to help out Mr. Webmaster and his family, and if you ask Joe, he'll tell you that Mr. W has done so much for his - all I can say is, WHAT A GREAT FAMILY! Mr. Webmaster has been doing the facebook thing since 2010, and I asked him why he thinks Joe's social media presence is so successful. He responded by saying, "I think it's been successful because it's really just an extension of Joe being Joe. Before there were electronic social networks, he was the center of a real social network. He knows almost everyone in town, and almost everyone knows him. He's as entertaining behind the counter as he is in his pictures, videos, and postings. It's not faked. That's what he's like." Finally, I asked Mr. W. where he gets the inspiration for al of the creative postings that were so crucial to Joe's NEPA Pizza Madness Victory and he shared: "The ideas for postings and promotions sometimes come from Mr. Webmaster staying aware of what's going on in the town, but more often than not, they come from talking to Joe - almost like being inspired by a chat with the late, great Yogi Berra." The concepts may sound simple, but it's all authentic, heartfelt and effective. These are important keys to being successful in social media. I could see a twinkle in Joe's eye behind his signature black-framed glasses that told me how proud he really was of this accomplishment. 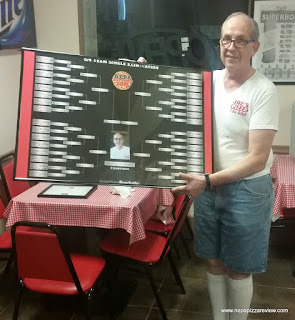 I presented him with his 2 foot by 3 foot winning bracket that I had put together, and he made me feel like it was a Super Bowl Trophy by graciously thanking me and immediately showing me which sign he was going to pull off the wall in the pizzeria to hang it up! I myself was so proud that a little online pizza tournament could mean so much to someone, and it really put the tournament and this whole pizza blog into perspective - we really do have something special here in NEPA. We care greatly not only about our amazing and diverse pizza, but also about the people behind the counters making those pizzas. We care about the small business owners that tirelessly wake up every morning to make the dough and put a great product and a smile together for us in good times and in bad. Joe embodies the spirit of enterpreneurship and community engagement. His perfect blend of humanitarianism, confidence, connection with customers and ability to concoct the best stromboli I've ever had are truly inspirational. I'm so glad I got to meet Joe and get to know him through the NEPA Pizza Madness Tournament. He's truly deserving of the honor, and even though he already threw a customer appreciation weekend for his loyal voters, he wanted to make sure to thank everyone who voted and all of the amazing pizzerias that competed!